The Lumix GF3 is Panasonic’s third ‘pocketable’ compact to employ the Micro Four Thirds standard it co-developed with Olympus. 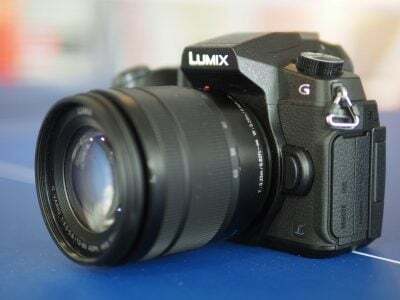 Announced in June 2011, it comes only seven months after the Lumix GF2, and like that model packs a large sensor into a small body with a removeable lens mount. Marketed as ‘The World’s Smallest & Lightest System Camera’ the GF3 continues on the path set by the GF2 towards a smaller, simpler, mirrorless interchangeable lens camera aimed at those looking to trade up from a compact. It would be fair to say that, coming a mere seven months after the launch of the GF2, the GF3 is essentially a smaller, lighter, faster, and simpler version. A lot of the specification remains the same: it has the same 3in touch screen and 12 Megapixel sensor as in the GF2, and although the new Venus Engine FHD processor adds faster AF and continuous shooting, the best video quality remains the same full HD 1080i in AVCHD format. It’s not only the GF3’s weight and proportions that have diminished. The rear thumb wheel has gone as have the hot shoe and electronic viewfinder port, while the earlier stereo mics have been replaced with a mono one. There are some gains too though, with Photo Style presets introduced on the G3 and Creative Control effects reminiscent of the Olympus Pen’s Art modes. In a market that looks to be settling into two camps it’s clear where the GF3 is pitched. 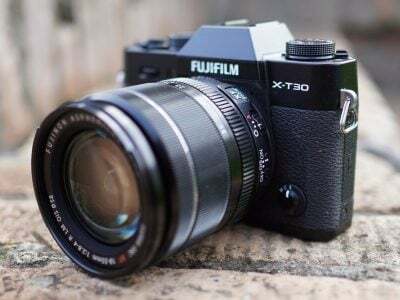 It has some close neighbours in the form of other models aimed at compact point and shoot owners who want more control without the bulk, expense and complication of a DSLR. Panasonic’s (Micro) Four Thirds partner Olympus has created a lot of excitement with the Pen E-PL3, while Sony’s Alpha NEX-C3 also provides compelling arguments in its favour, not the least of which is it’s larger APS-C sensor. So we’ve tested the Lumix GF3 alongside these two models to see which is the best option if you’re feeling stifled by the constraints of your point and shoot or simply crave the scope and versatility of an ILC but want the option of keeping things simple. The Lumix GF3 is a very different looking camera to the previous GF2. It’s not just a question of size and weight, but shape and styling. If the original GF1 had a classic rangefinder form and the GF2 was a transition to something more contemporary looking, then the GF3 takes that journey to its logical destination with styling that eschews the fashion for looking to the past and in fact resembles a modern compact more than anything else. Above I’ve pictured the three generations of Lumix GF, starting with the original Lumix GF1 on the far right, with the GF2 sandwiched in the middle and the latest GF3 on the left. It’s clear how the system has evolved between models, first with a significant reduction in size between the GF1 and GF2, followed by further shrinking and a curvy redesign with the latest GF3. The 3in screen is pressure sensitive, rather than capacitive, but responds well and has the advantage that you can use it with gloves on. The touch icon layout is clear and uncluttered with the Shooting mode in the top left and three buttons on the right edge for accessing the Q Menu, toggling touch-screen shooting and toggling the display info overlay. The GF3’s screen has a 3:2 aspect ratio which means there are narrow black vertical bands down either edge when shooting in the native 4:3 aspect ratio. Unlike the 16:9 screens of the Olympus E-PL3 and Sony NEX-C3, the black edges aren’t wide enough to accommodate the icons which on the GF3 extend into the active image area. And, of course, when you press the movie record button on the GF3, horizontal black bars appear top and bottom when shooting in 16:9 movie modes. A screen which needs to deal with stills and photos which are different shapes will always involve a compromise, but by opting for a 3:2 shape, the GF3’s screen allows both formats to be composed and reviewed at a reasonable size. It’s certainly better-suited for composing and reviewing stills than the screens on either the Olympus E-PL3 or the Sony NEX-C3. But one thing both those models have over the Lumix GF3 is that their screens aren’t fixed, but can flip up or down. So if you like to seek out unusual angles, or like to shoot from the waist those models might suit you better. The GF3’s 3in screen is clear, bright and contrasty. Though you can use the physical buttons to access the screen-based functions, it soon becomes second nature to use the touch screen. For example, pressing the menu button at the centre of the control wheel displays a screen from which you can select the Record (exposure) mode, Record settings, Motion picture settings, Custom settings, setup and playback. Again you have the option of touching these, or navigating them using the control wheel. But if you want to switch exposure modes the simplest way is to press the touch icon at the top left which takes you straight to the screen that displays a circle graphic from which you can touch to select (or, again spin the wheel to) the exposure mode you desire. The GF3 does have one physical button for selecting exposure mode and thats the iA button right next to the shutter release; iA is short for Intelligent Auto and is Panasonic’s fully automatic shooting option. The iA button glows blue when selected (either by pressing the button or selecting iA on screen) and sets either iA, or iA+ mode depending on which of those two options was last chosen; I’ll go into more detail later on this page. Another thing that separates the Lumix GF3 from the Pen E-PL3 and NEX-C3 is its built-in flash. The advantages of integration are that it’s always there, the disadvantage is that it isn’t very powerful. A guide number of 6.3 at 160 ISO gives it a maximum distance of 1.8 metres at the f3.5 maximum aperture of the 14-42mm kit zoom. Both the Pen E-PL3 and NEX-C3 have an add-on flash with a more powerful guide number of 10 at their base sensitivities of 200 ISO, providing a maximum distance of 2.8 metres. Perhaps more importantly, you can attach an external flash to the Pen E-PL2 and NEX-C3, but the lack of a hotshoe on the GF3 means that isn’t an option. One other problem I found with the GF3 flash is that although the stalk extension raises it quite high, the 14-42mm kit lens can caste a shadow on objects in the close foreground, even with the lens hood removed. The Lumix GF3’s battery provides enough power for 320 shots with the stabilised 14-42mm kit lens attached. Swap that for the unstabilised 14mm pancake lens and you’ll squeeze out an extra 20 shots. It uses SD (HC, XC) cards and Panasonic recommends speed Class 4 or higher for AVCHD video recording and speed class 6 or higher for MJPEG video recording. Behind a plastic cover on the right of the body you’ll find a mini HDMI port and a combined USB / AV out port. The Lumix GF3 is equipped with a standard Micro Four Thirds lens mount and, like full-sized Four Thirds bodies, its sensor results in a field-reduction of two times – so the 14-42mm kit lenses offer equivalent coverage of 28-84mm. The GF3 can use any Micro Four Thirds lens, and thanks to the short sensor to mount distance, various adapters allow it to accommodate a number of other lenses. 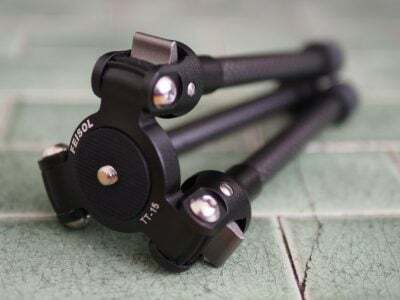 Most obviously there’s an adapter for full-sized Four Thirds lenses, but additional third party adapters allow you to mount Nikon F, Canon FD, Pentax K, OM system, Voigtlander and Leica M lenses. Note there may be restrictions regarding autofocus, particularly during movies, with certain Micro Four Thirds lenses – see Panasonic’s Lumix GF3 lens compatibility page for full details. The Lumix GF3 is available as a body only, or in a kit with either the 14-42mm kit zoom (H-FS014042E), or the 14mm f2.5 pancake prime (H-H014) (which doesn’t have optical stabilisation), or with both. We tested the GF3 with the same lens as we used for our GF2 tests – the 14-42mm f3.5-5.6 kit zoom. If you’re interested in the pancake prime take a look at our Panasonic 14mm lens review. It’s also worth mentioning Panasonic’s latest Power Zoom lenses, which as their name suggests, employ motorised zooms for smooth adjustments while filming video. The Lumix G X PZ 14-42mm Power Zoom is also very small – when not in use it retracts to become little larger than the 20mm pancake prime – which makes it a great option for the GF3. Among the standard 14-42mm kit lens’ advantages are its excellent quality and fast and quiet auto focussing. The latter is a particular advantage for shooting video and combined with the GF3’s touch screen focussing makes for some very slick focus-pulling. At its maximum 42mm focal length the front section of the lens extends to give a total length of 88mm. Like the Olympus and Sony lenses, it doesn’t rotate, so you can use a circular polariser in the 52mm thread. It’s also supplied with a bayonet lens hood which can be reverse-mounted for compactness when not in use. Note unlike the Olympus 14-42mm, neither the Panasonic nor Sony standard kit zooms can be retracted for transportation. The latest Lumix 14-42mm Power Zoom can retract, but it’s a new and premium option. 100% crop, 14 – 42mm at 42mm, 200 ISO 1/8, O.I.S off. 100% crop, 14 – 42mm at 42mm, 200 ISO 1/8, O.I.S Normal. The Lumix GF3 body has no in-built stabilisation, but the 14-42mm kit lens is optically stabilised using the same MEGA O.I.S lens-shift system available on the Lumix compact range. The obvious downside is if you want stabilisation, you’ll need to choose a lens which features it, whereas the built-in stabilisation of the Olympus bodies works with any lens you attach, including primes and wide-angles. There are other optically stabilised lenses in the Panasonic Micro Four Thirds range, but it tends to be reserved for zooms. Neither the 14mm f2.5 nor 20mm f1.8 pancake primes are stabilised – unless of course you mount them on an Olympus body – which can be frustrating if you’re filming handheld video with the GF3. So, at the risk of stating the obvious, it’s the 14-42mm kit lens lens we’re testing here, rather than the camera, and we did so by zooming it to its maximum telephoto range of 42mm (84mm equivalent) and taking a series of handheld shots at a range of shutter speeds both with the stabilisation turned off and with it turned on in Normal mode – a third, panning mode is also available. The crops above are from shots taken with the GF3 in Shutter Priority mode with an exposure of 1/8. The one on the left was shot with MEGA O.I.S turned off and the one on the right with it set to Normal. Ordinarily with an 84mm (equivalent) lens you’d expect to be using a shutter speed of around an 80th of a second to avoid camera shake. So the 14-42mm’s MEGA O.I.S. stabilisation is providing a little over three stops over traditional wisdom. The Lumix GF3 retains the same shooting modes as its predecessor. Pressing the shooting mode icon displays a screen with, iA, iA+, P, A, S, M, Custom and scene modes. There’s a new addition called Creative Control which, were it on an Olympus, from where it is clearly inspired, would be called Art filters. The GF3’s creative control modes include Expressive, Retro, High Key, Sepia, High Dynamic and Miniature. Intelligent Auto (iA) mode, as seen on Panasonic’s latest compacts exploits a number of technologies including Scene detection, face detection, digital red-eye removal, Intelligent ISO, Intelligent exposure, Long shutter noise reduction, Quick AF, focus priority and backlight compensation to deliver a seamless automatic experience that has an uncanny ability of figuring out what you’re trying to take. Like the GF2 before it, the GF3 seamlessly switches between Landscape mode when pointed at a distant scenery, Macro when moved toward a close subject, and Portrait with Face Detection when turned towards people. You can even drag an on-screen slider with your finger to choose the degree of background blurriness, thereby working like a beginner-friendly version of aperture priority. iA continues to be one of the cleverest fully automatic modes we’ve tested, exploiting the camera’s full range of technologies, and fulfils Micro Four Thirds’ brief to be easier to use than a traditional DSLR by complete beginners. The new iA+ mode works exactly the same way as iA, with control retained over white balance and exposure compensation via on screen blue/red and brighter/darker sliders. The GF3 builds on the Autofocus capabilities of the GF2, which proved itself both fast and capable. Panasonic has both increased the response speed of the contrast-detect AF system and expanded it to cover the whole of the sensor area. In use, it feels at least as fast as some DSLRs and for anyone moving up from a compact it will feel like a massive improvement. The touch screen can of course be used to set the focus area and this provides great opportunities for manual focus pulling while shooting video – see below for an example of this in use. There’s also a new Pinpoint AF mode, ideally suited to tripod-based shooting, which provides a magnified view allowing you to precisely position the focus point. Movies can be recorded in either AVCHD or Motion JPEG format with a frame rate of either 30fps (in NTSC regions) or 25fps (in PAL regions). There are two quality options for AVCHD recording, FSH is 1080i60 (50i PAL) and SH 720p60 (50p PAL) both with an average bit rate of 17Mbps. With Motion JPEG selected the quality options become 720p, VGA (640 x 480) and QVGA (320 x 240) all at 30fps regardless of region. In the best quality FSH mode, you can record for 130 minutes with the 14-42mm kit lens before the battery gives up, but for taxation reasons European models are limited to a maximum recording time of a second shy of 30 minutes. The GF3’s mono mic did a good job of picking up ambient sound and speech, like most built-in mics it’s a little susceptible to wind noise, but a three-position Wind cut filter helps alleviate this. The overall quality of the GF3’s 108050i AVCHD video is excellent. There is a little bit of focus hunting going on, but a bigger problem is operating the zoom ring on the 14-42mm kit lens, which can be a little sticky and hard to turn smoothly. To be fair though, it’s hard to smoothly adjust the focal length on any lens with a manual zoom ring, which is where Panasonic’s latest motorised Power Zoom lenses offer a key advantage. If you like to zoom while filming, it could be worth investing the extra on one of these models. The Lumix GF3’s CMOS sensor deals well with bright highlights and water reflections in this tripod-based panning shot, and the focus is held reasonably well during and at either end of the zoom. No radical change in exposure on this interior low-light panning shot, so the window section is blown out. During panning the focus seems a little unsure, but settles down when the pan stops. I’ve included this clip to demonstrate the touch-focus capabilities of the GF3 by touching the screen in the area of the coffee cup and the beer pumps on the bar. It’s very responsive and you can only just hear the dull clunk of the AF motor in action. Suffice it to say achieving a similar focus-pulling effect by manually turning the focusing ring can be very difficult indeed, so it’s a key advantage of the GF3’s touch-screen system. By far the biggest change in terms of GF3 handling is the omission of the thumb push-wheel. I really missed this control: using the A and S modes and program shifting in P mode is just a little less natural when you have to shift your thumb down to the control wheel. To be fair, the GF3’s touch screen reduces the need for physical buttons and it isn’t the only manufacturer to simplify the control layout. It’s also interesting that both Olympus and Sony have reserved touch screens for their higher-end ILC models – the E-P3 and NEX-5N, opting for customisable buttons on the entry-level E-PL3 and NEX-C3 instead. Personally, I love buttons, but I think Panasonic has got the right idea and a simplified button layout with functions migrated to the touch-screen will appeal more to the market the GF3 is aimed at. In use I found the GF3’s menu system quick and responsive and the crossover between physical controls and touch icons, rather than the confusion you might expect, actually works very intuitively. Panasonic’s Q Menu is is at the core of it, providing quick access to commonly used functions and alowing a high degree of customisation. Image stabilisation, burst shooting, and flash settings don’t appear on the default Q menu, but it’s easy enough to add them. The Lumix GF3 has three continuous shooting modes, L, M and H with frame rates of 2, 2.8 and 3.8fps respectively. There’s no live view in H mode, so what you see between frames is the last frame shot, however, this is only marginally worse than live view which blanks the screen between every shot, making it quite difficult to see what’s going on. On the plus side, in H mode the GF3 sustained a rate of 4.1fps for a burst of 12 frames, before slowing drastically. If you’re shooting raw the burst limit reduces to about six frames. The Lumix DMC-GF3 has a 12.1 Megapixel MOS sensor with a maximum still image size of 4000 x 3000 pixels. The sensitivity range runs from 160 to 6400 ISO and shutter speeds manual modes can be set from 60 seconds to 1/4000 though there’s no bulb setting. To see how the quality of the Lumix GF3 measures-up in practice, take a look at our real-life resolution and high ISO noise results pages, browse the sample images gallery, or skip to the chase and head straight for our verdict.